I got up early Friday morning, thinking about how to get my self-portrait back on track. (It had derailed the day before.) I thought I knew what was bothering me about it, and was anxious to get to the studio and fix it. But I decided to try out my ideas first with a digital overlay. So I opened the photo of the portrait from the preceeding day, saved the file, and opened it in Painter. Then I drew over it using digital pastel. I was right! 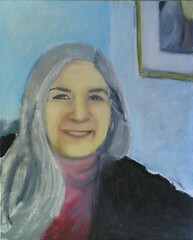 The day before, as I painted, I had slowly shifted the placement of the features. The result was that the eyes were too far apart, and the forehead was too short. So I used digital pastel to draw changes in to correct those problems, and this image is the result. I was relieved, because although this is still not a likeness, it is a lot better than the previous day's version. I printed this image out, and took it to the studio to use as a reference when I made similar changes in paint on canvas. To be continued. . . .